Posted in Books, Pioneers, Products. 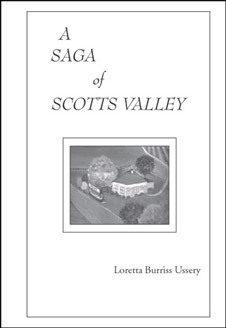 A Saga of Scotts Valley is more than the history of a place and the people that lived there. It’s bits of memories told by the people who lived in the original homesteading era–a barn raising, a wagon ride, encounters with bears, the first buck hunt of three eager boys and more—preserved by Letty Ussery’s pen for us all to enjoy. She did the collecting, the writing, the remembering in the hopes that people will realize that they’re involved in history themselves. As Letty reminds us, what seems insignificant today becomes significant history later. Everyone has a story to tell.